NEW YORK, September 19, 2012 – Worldwide comedy sensation Jeff Dunham will debut his fifth comedy special just in time for Halloween! “Jeff Dunham: Minding the Monsters” premieres on Sunday, October 7 at 9:00 p.m. ET/PT on COMEDY CENTRAL. Filmed at Savannah, Georgia's Lucas Theater, Dunham is joined by the whole gang. Fans are in for a treat when Walter, Peanut, Bubba J, José Jalapeño (on a STEEK! ), and Achmed the Dead Terrorist command the stage like never before. Enter the ultimate haunted house where Walter transforms into something grumpier than he already is, beer-swilling redneck Bubba J rises from the dead, Peanut becomes his alter ego, The Purple Avenger of the Night, and Achmed dresses to kill in an outfit that would terrify even the most terrifying terrorist. In “Minding the Monsters,” Dunham's phenomenally successful comedy is taken to a whole new level that's so funny it's scary! 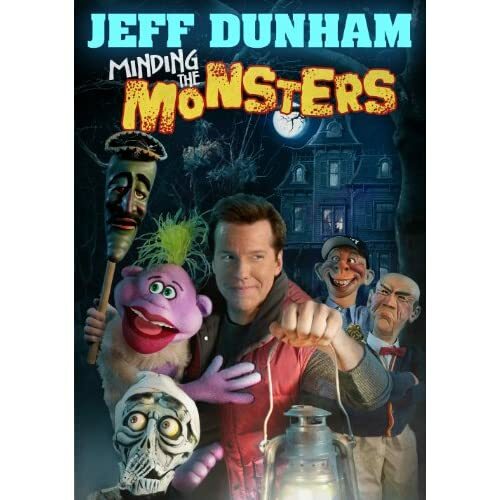 The “Jeff Dunham: Minding the Monsters” DVD and Blu-ray will be released by COMEDY CENTRAL Home Entertainment and Paramount Home Entertainment on October 9. The DVD and Blu-ray will be packed with special features and extras including: a hilarious collection of “Monstrous Mistakes,” outtakes from the special's taping; a behind the scenes look in which Dunham shows Walter's transformation into the grumpiest monster ever; a backstage “Tour of Terror” that reveals the inner workings of the set; a “Minding the Miniatures” look at how the special's miniature mansion and graveyard were made; a behind the scenes “Monster Movie Magic” glimpse into the filming of the trailers; and a “Frightening Photos” visit to the “Minding the Monsters” photo shoot. Audio commentary and bleeped and uncensored options are also included to provide family- friendly viewing for Dunham's fans of all ages. Dunham's four previous specials, “Arguing with Myself,” “Spark of Insanity,” “A Very Special Christmas Special,” and “Controlled Chaos,” have all been huge ratings successes on their COMEDY CENTRAL debuts. “Controlled Chaos” was the cable channel's highest-rated stand-up special of 2011, and “A Very Special Christmas Special” has become a holiday tradition, as “Minding the Monsters” is sure to also be in the future. International sales of the previous DVDs/Blu-rays are rapidly approaching eight million copies, and clips from the specials have generated more than half-a- billion worldwide views on YouTube and other online sites. Rated by concert industry trade publication Pollstar as the highest-earning stand-up concert comedian in the world for two consecutive years and in North America for three years running, Dunham sold over half-a-million tickets in 2011 and is so in-demand by promoters and his loyal fans that more than 50 shows are already planned for next year. This past summer he took his Controlled Chaos tour to Australia for his second tour of the nation and made his live New Zealand debut. Further information on Jeff Dunham is available at www.jeffdunham.com. OMG, so damn funny. For a 13 year old, he sure has perfect timing when delivering a joke. Funny stuff. Watched this last night and it still holds up well after all these years. Pryor is one of the first comedians that I just held onto every word and couldn't wait for more. A unique comedian in his own right. His stuff is timeless. IMO, watching him is far more entertaining than just listening to his bits, but his bits are priceless, which says so much more for watching his face. Incredibly funny. Hahaha. I didn't know where he was going with this, but the punchline was f*cking hilarious! punch line was so so....the set up at the end was pretty funny! This man always makes me laugh and at the very least smile. He's celebrating 65 and continuing his 700 Sunday Play. lately he's been featured on The Today Show and Sunday Morning. I've known about Jay Mohr for years, but have never seen one of his stand ups. Well checked out one on Encore last night and it was great. Yeah he has always been funny. The ALL look so young!!!! Larry has been around for a long time. I loved his delivery.